Hail, rain, crazy wind and other 99 teams did not stop Jarad Kohlar and Lisa Dominguez from taking out Sprint Series Adventure race last Sunday. Kim Willock and Dave Cole were chasing them all the way but small navigational mistake did not let them to beat Jarad and Lisa. The course was set up in spectacular Lysterfield park, the iconic Melbourne adventure playground with pristine lake, dedicated mountain bike trails, detailed orienteering map and few hills to negotiate. The weather added few challenges switching on Melbourne classic winter conditions: showers followed by gusts and some sun in between. The event was created to accommodate all sorts of teams and these expectations were delivered. Novice course attracted family and novice teams, while classic course field was highly competitive with serious battles at the sharp end. The race started with run and paddle legs, with half of a field paddling and another running, then they swapped and joined again on a third mountain biking leg. In the middle of the ride first fastest teams were offered to do advanced mountain bike leg, while the rest of the field proceeded to the finish. It took 3:17:51 the leaders to complete the distance (including the advanced leg) while the last team spent more than 5 hours on a course. “t's great to see the sport of Adventure Racing on the up in Victoria with over 200 people enjoying the Lysterfield Lake, MTB and running trails on Sunday. 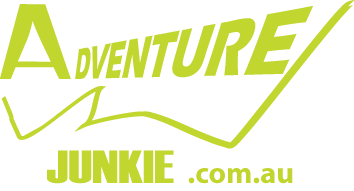 Adventure Junkie designed a fun but challenging course, partially the advanced MTB section. I teamed up with one of the Peak Adventure athletes Lisa Dominguez. It was one of her first adventure racing events and her first win. She is in training for the Kathmandu Coast to Coast event. Race highlights for me was out navigating Angus Robinson Junior MTBO World Champion at one of the last CP's. Adventure Junkie Lysterfield Sprint AR is a must do event for anyone new to Adventure Racing”, - said Jarad Kohlar, race winner. “So soggy, so cold, but so much fun at Lysterfield today. Felix and I ( the Tandoori Chickens ) took on 99 other teams at the Adventure Junkie Adventure Race. I hope to be there again next year - unless I get dumped from the team. Thanks Maria Plyashechko and Sergey Kurov for yet another great event.”, said Rob Davis, 3d in Male category in Classic course teamed up with his 11 year old son Felix. “We are quite happy how the event went”- said Maria Plyashechko, event organizer, “it is a hard task to create the event, suitable for all levels, but looks like we are getting there, all participants seemed like they were having fun out there on Sunday”.